We encourage everyone age 15 and older (college & high school students, retirees, teachers, stay-at-home moms, dads, grandparents) to apply! We are always looking for friendly, outgoing, energetic people who can work weekends in September and October. 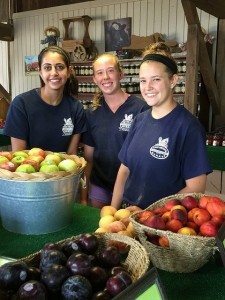 Interested in working at VonThun Farms? Interested in working at the farm? Submit your application and we will keep it on file. Occasionally throughout the season we find ourselves looking for friendly, motivated individuals to join our farm staff. VonThun Farms has some great Fall employment opportunities available. Applicants must be honest, responsible, friendly, outgoing, & willing, able, and eager to interact with our customers/general public. Applicants must be 16 years of age or older. Did we mention applicants must be outgoing & eager to interact with the general public? SORRY, but the Fall isn’t the time for shy or reserved individuals to apply. New employees will be hired for specific weekend jobs. Fall weekends start in mid-September and run through Halloween (only 6 weekends). Both Saturdays and Sundays are MANDATORY for all weekend employees. Interview dates & times will be announced and posted via email and Social Media. Each July and August we host our group interviews, hiring new Fall employees. We require that all new Fall employees attend a group interview. Submit your employment application now and we’ll email you with our group interview details.